See the website: Cainnt mo Mhathàr for recordings of native speakers of Gaelic on Cape Breton Island, Nova Scotia, Canada. 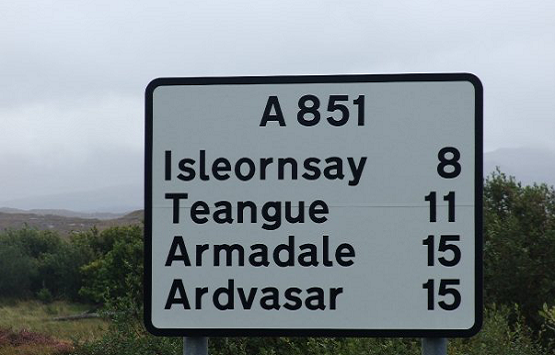 Both signs stand a few metres apart on the same road on the Isle of Skye (An t-Eilean Sgitheanach) and in fact, give the same information. However, they are unusual in that multilingual signage that is appearing in many parts of the world tends to put two or more languages on the same sign. 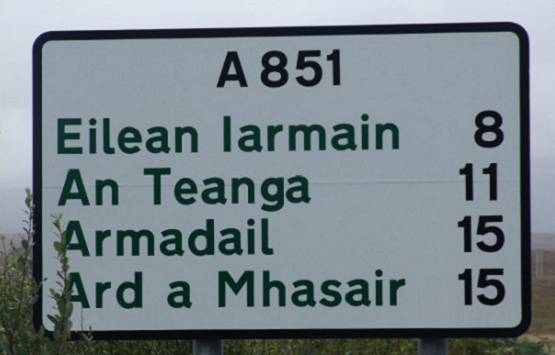 These signs are also unusual since the Gaelic sign comes before the English one. Many multilingual signs tend to put the dominant language first.